The classic commemorative period began in 1892 with a Congressional Act authorizing the production of specially-designed half dollars made up in the likeness of Christopher Columbus, to be sold at $1 a piece with the proceeds going to help fund the World's Columbian Exposition, a World's Fair held in Chicago, Illinois. Wyckoff, Seamans, and Benedict, manufacturers of Remington typewriters, publicly offered $10,000 for the first coin struck. Famously, that first coin was rejected due to a planchet flaw, as recounted in Swiatek & Breen's The Encyclopedia of United States Silver & Gold Commemorative Coins. The next coin struck passed muster, however, and was sent on its way. The Remington Company soaked in the publicity, mainstream America saw for the first time the potential for financial gains through the hobby of coin collecting, and to this day, and the Columbian Exposition half dollar has become a staple for beginning and advanced coin collectors alike. But there's another, far richer story of American numismatics out there, one that pre-dated U.S. issued commemorative coins by more than sixty years and one which provides us with a much richer and more informative window into many of the great celebratory events of the late 19th and early 20th centuries. Just as Hard Times Tokens provide a window into Jacksonian America of the 1830s, So-Called Dollars, the name given to large dollar-sized medals and tokens, offer us today a clearer glimpse into America's growth as a major world power, architectural giant, and technological innovator. In this first part of a two part feature on So-Called Dollars, Hubert and I will look at several So-Called Dollars that overlap with Congressional sanctioned commemorative coins. We set out to look for parallels of these competing products, several of which were sponsored and distributed by the same event organizers and sold at the same price. What is a So-Called Dollar? It is said that New York coin dealer Thomas Elder first used the term "So-Called Dollar" in an auction for a Theodore Roosevelt medal that was commissioned and sold at the 1904 Louisiana Purchase Expedition (better known as the St. Louis World's Fair). A growing sentiment for these medals took shape over subsequent years, only to be jump started by a seminal Numismatic book titled: So-Called Dollars: An Illustrated Standard Catalog which was written by Harold E. Hibler and Charles V. Kappan and published in 1963. The volume was the most comprehensive study of American public-private medals and tokens of its time, focusing specifically on pieces struck in or struck for the United States, measuring between 33 and 45 mm, and mostly focusing on national or regional celebrations, and various other numismatic themes. Hibler and Kappen established a stringent set of guidelines and sought to canonize these medals, which they rightly saw as important pieces of Americana. The So-Called dollars book became a cult favorite after it went out of print. Copies of the book were scarce on the secondary market and usually carried a premium. Fortunately, in 2008, four So-Called Dollar experts: Tom Hoffman, Dave Hayes, Jonathan Brecher, and John Dean were granted permission by the copyright holder to publish an updated version of the book. This second edition updates the 1963 version with new illustrations and historical information and presents it in an attractive full color presentation that makes for one of the more attractive numismatic books on the market. Another recommended book on the topic was published last year by ANA Executive Director Jeff Shevlin, it called: Discover the World of Charbneau So-Called Dollars From the 1939-40 Golden Gate International Exposition: An Illustrated Reference. The volume can be purchased here. The most significant Fair in American history was the World's Columbian Exposition, an enormous undertaking that catapulted Chicago into national prominence and it is said, stoked the imaginations of Walt Disney and Frank Baum, two men who were so taken by the architecture and festive atmosphere of the event that they used their memories of it to build Walt Disney World and create the famous fictional destination, the Emerald City. The event was held from October 21, 1892 through November 2, 1893 and drew over twenty million paid visitors. In order to subsidize the construction of the temporary city, Congress authorized the minting of up to five million Columbian half dollar coins, and at the behest of members of the Board of Lady Managers, up to 40,000 quarter dollars bearing the likeness of Spanish Queen Isabella. At the outset of the event, the commemorative coins were offered at $1.00 a piece, with the half dollar doing selling demonstrably better than the seemingly overpriced quarter, although it did fail to meet its maximum authorized mintage limit. These two legal tender issues are interesting in their own right, but cannot possibly capture the spirit of the event like the more than 100 medals and tokens issued by the many different vendors and pavilions. These So-Called dollars vary greatly in design and style and came in a variety of compositions, including aluminum, which at the time was a novel new metal. Many of the pieces celebrated the architectural beauty of many of the pavilions, including one designed by founding member of the Chicago School, Louis Sullivan. Others, depicted Christopher Columbus. Of great numismatic significance is the below pictured So-Called dollar which features a Beaux-Arts rendering of Columbus with his arms outstretched. This elegant piece was designed by the great Augustus Saint Gaudens with a reverse designed by Mint Chief Engraver Charles Barber. The pair teamed up to create this medal for Chicago pillow manufacturer C. Emmerich & Company. The medal was struck at the Philadelphia Mint. It would not be their last collaboration. The use of the Roman numeral MCCCCXCII should catch the attention to collectors familiar with the first year issue of the Saint Gaudens double eagle. 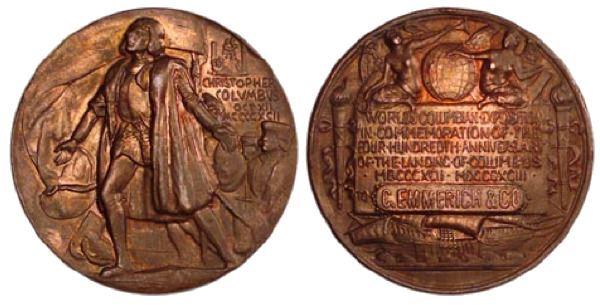 HK:223 Augustus Saint Gaudens and Charles Barber teamed up to create this fantastic medal commemorating the World's Columbian Exposition. Fans of the Isabella quarter may consider adding the Board of Lady Managers So-Called dollar to their collections. This 38mm piece was struck on Aluminum and features Mrs. Potter Palmer, Chicago socialite and wife of Hotel Magnate ... . Palmer. Her So-Called dollar comes in two configurations, one with scalloped fan ornamentation in the field and one without. One would assume that these medals would have been sold side by side with the legal tender quarter. Fewer than 100 of each are known to survive. 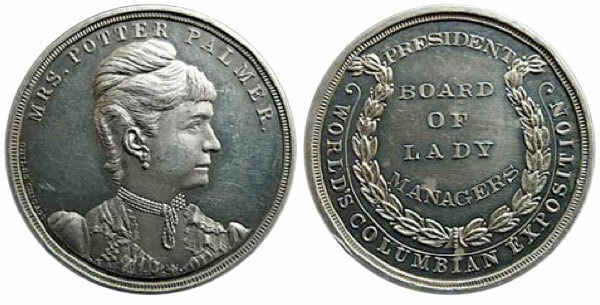 HK-243c: Wife of retail magnate, Bertha Honoré Palmer, depicted above served as the President of the Board of Lady Managers, which oversaw the creation of Woman's Building as well as saw to the distribution of the 1893 Isabella quarter. There are nearly fifty So-Called dollars which celebrate the various buildings constructed for the Fair. 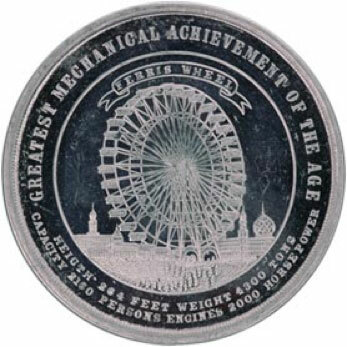 Four pieces commemorated what many people considered the Exposition's signature architectural achievement; the 264 foot tall Ferris Wheel. Named after it's designer George Washington Gale Ferris, Jr.. The Ferris Wheel was America's answer to the Eiffel Tower, which was built just four years prior to serve as the centerpiece of the 1889 Paris Exposition. Costing $400,000 to build, the Ferris Wheel was a popular attraction, costing fifty cents per ride and carrying over 1.5 million passengers, earning the fair $750,000. After the fair closed, the enormous ride was moved to an affluent Chicago neighborhood, where it continued to operate until being dismantled and moved to St. Louis for the Louisiana Purchase Exposition in 1903/1904.